Heat oil in a pan and fry the onions lightly. Add the chicken and mix in the garlic paste. Saute for about 5 minutes on medium heat. Add the chillie powder, tumeric powder, cinnamon, cloves, cardamom, red chillie, pepper corns and salt. Mix well and stir fry for a few minutes. Add ½ cup of water and cook till the chicken is tender and the gravy is quite thick. 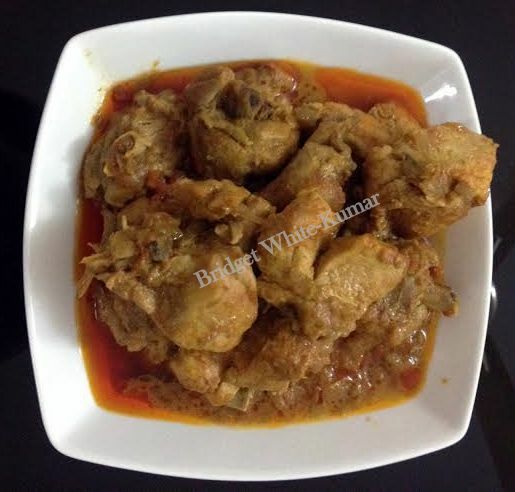 Posted on January 9, 2016 January 12, 2016 by Bridget White-KumarPosted in chickenTagged Colonial Anglo-Indian Chicken, Country Captain, Grandma's Country Captain Chicken. Chicken Curry. Isn’t this like dehati chicken or near abouts?